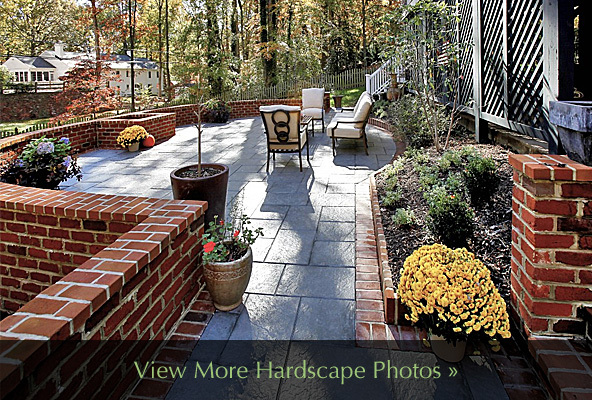 Cartwright Landscaping specializes in designing and installing exceptional hardscapes made from brick, bluestone, slate, pavers and other various flat stone. Through our close relationships with local vendors coupled with our skilled craftsmen and brickmasons, we can provide our clients with an extensive range of products and options that best suit their desires for their perfect hardscape. Clients will work closely with owner Jeff Cartwright and our hardscaping foremen on all hardscaping projects, from initial consultation to completion of all work. If you’d like to discuss your ideas for an outdoor hardscape, contact us to schedule a convenient time to meet with owner Jeff Cartwright. 1 Jeff Cartwright will meet with clients for a free initial consultation to determine client’s needs, desires, requirements for their hardscaping project. Potential designs, tentative measurements of area to be hardscaped, hardscape material and color, and the parameters of the project and budget issues will also be discussed. At the initial consultation, we will also provide and will review with you literature providing numerous hardscaping materials and options. 2 Jeff will then provide client with hardscape material samples or accompany client to stone yard and/or paver or brick showroom depending on material to be used to educate clients on all options available to them so they are fully informed when deciding on what hardscaping material to use for their project. 3 Once it is determined what material will be used, we work with clients to create a design plan. A design fee will be charged based on the scope of the plan. Using ropes we’ll lay out the perimeter of the new hardscaping in accordance with the design plan. Any changes in the shape or the size of the hardscaping surface area can be made at this point. Our goal is to ensure the client gets the best visual perspective of the size and dimensions of their new hardscape before supplies are ordered and excavation commences. 4 Once the client signs off on the final hardscape design, a price quote can then be generated based on purchase and delivery of all hardscaping, base and joint materials plus the labor hours required to complete the project. All work necessary to complete the project will then be discussed with the client and memorialized in a contract to be signed by both parties. Once a contract has been executed all required materials will then be ordered and delivered to the work site. 5 The right type and thickness of your hardscaping surface base is essential to support and ensure the long-life of your hardscaping surface. Prior to the base being installed, the area to be hardscaped will first need to be cleared or all grass, debris and the ground will need to be excavated, raised or leveled off in accordance with the type of hardscaping surface to be installed, the design plan, and the slope of the land. If the hardscaping surface area is bluestone, slate or some variation of flat stone, Cartwright Landscaping strongly recommends a four inch concrete slab be installed. In order to construct a solid, strong slab, the ground will first need to be excavated to a depth of about six inches. Two inches of hardpacking paver dust will then be laid and compressed with a motorized tamper. Four inches of concrete will then be laid on top of the compacted paver dust and molded to the perimeter shape of the hardscaping surface. If the hardscaping surface is a brick or paver surface, Cartwright Landscaping will install a three inch paver dust base which is then compressed with a motorized tamper. Base installation for any hardscaping surface must take into account and incorporate a slight pitch to address drainage and run off issues as well as keeping the base surface flat to avoid undulation when the hardscaping surface is installed. 6 The hardscaping surface for flat stone surface installation can begin once the slab has begun to cure, usually within twelve to twenty four hours. The first step we take when installing the flat stone surface is to lay out the flat stone on the base exactly as it will look when the project is complete. Any necessary cuts to the flat stone are precisely made as this time using a diamond blade commercial saw. Once the all cuts have been made to the stone, a few stone are removed from the base and mortar is then mixed and spread onto the base. The few stones that were removed will then be carefully set into the wet mortar taking great care to ensure the required slope and flat surface of the hardscaping. This process will be repeated until all of the stone has been set into mortar mix on top of the base. Once all stone has been laid and is level along the correct grade, the joints will be then be completely filled with mortar mix. All joints and the flat stone will then be wiped with semi-abrasive sponges to clean the new hardscape surface. The landscaping surface for brick and pavers is laid directly on top of the base with adjustments being made to ensure the necessary grade and flat surface. We commence our brick and paver surface installation by laying out the border around the perimeter edge and making the necessary cuts to ensure balance and symmetry. We then begin installing the interior of the hardscaping surface starting from the middle of the area working toward the border. When the interior area meets the border, necessary cuts will again be made to ensure balance and symmetry. Once all the brick or pavers have been laid and are level along the correct grade, the joints will either be filled with sand or polymeric sand. Filling the joints with regular sand allows the hardscaping surface to be somewhat permeable, reducing water run-off. Polymeric sand has the same texture as regular sand but once water is applied and it dries it becomes a non-permeable surface. The main advantage of polymeric sand is to add durability to the hardscape area and stop ants from burrowing and making anthills though and on top of the joints. 7 Two or three days after a flat stone hardscape has been completed the hardscape surface will be scrubbed with muratic acid to clean any concrete film off of the stone surface. A few months after the flat stone hardscape surface is complete the surface can be sealed to provide extra protection against the elements. Once a brick or paver hardscape is complete, after a month the sand will settle requiring that the joints again need to be filled again with either regular or polymeric sand. After a second application of polymeric sand is applied and watered no further polymeric sand joint filling is necessary. Once the second polymeric joint application has occurred and has settled the hardscaping surface can then be sealed to provide extra protection against the elements. Joints in a brick or paver hardscape filled with regular sand will require replenishment likely on a bi-annual basis as rain, wind, ice and snow can displace the sand. Hardscapes with regular sand joints are permeable and cannot be sealed.